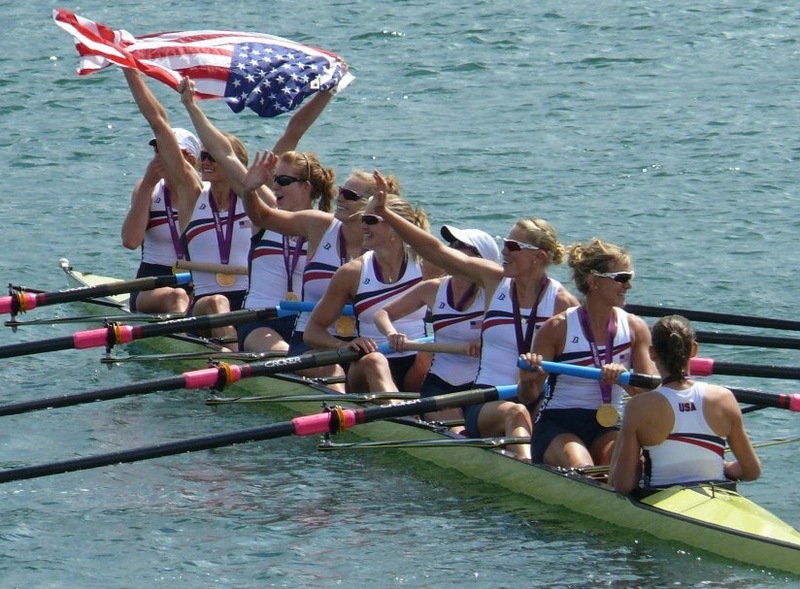 Esther Lofgren won gold in the women's eight at the 2012 Olympic Games. 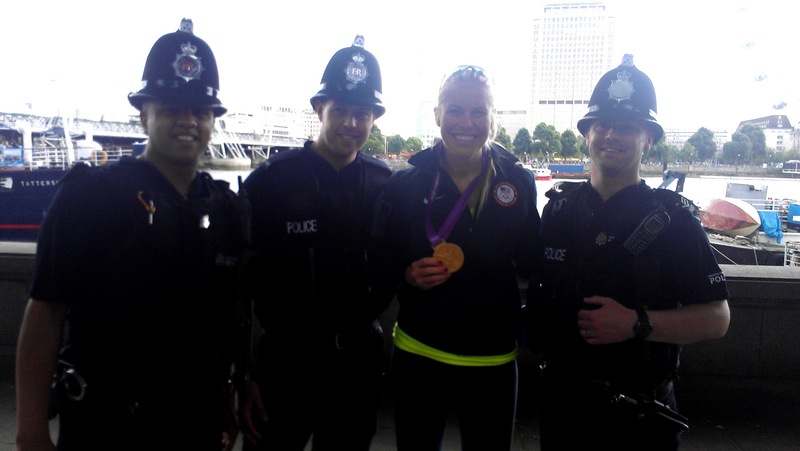 She is a seven-time U.S. national team rower, current World Record holder in the eight, four-time World Champion and seven-time World Championship medalist. 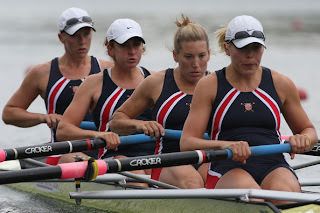 She blogs for USRowing about training, racing, and the life of an elite rower. The Frankenstorm is officially here! Thankfully, everyone in the DC area is currently safe and sound, and hopefully will continue to be for this entire weather event. Rowing-wise, like most rowers up and down the East Coast, we were stuck indoors this morning, and probably will be for the next several days. But just because there's no Metro or school, there's no reason to skip a workout! So to help keep that motivation going even when wading's required to get to the erg room, here's the FrankenStorm FrankenPlaylist. Enjoy! Links go to iTunes or Soundcloud preview. All songs available on iTunes, Soundcloud, or YouTube for download. As always, the first 25 to post on Facebook win a copy! 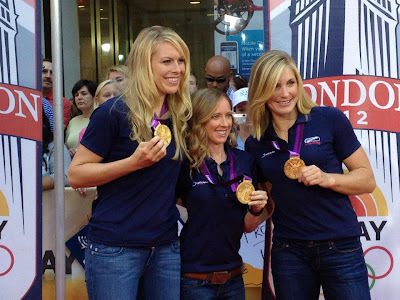 ...doesn't stay at the Olympics, it's going up on this blog! Just out of the P &amp; G Salon for the Oakley party! In all seriousness, everything post-Olympics over in London was pretty amazing. Not as debaucherous as everyone keeps wondering, but an incredible trip, with every single day jam-packed with awesome. The earliest I went to bed after moving into the Olympic Village was 5:15am--yes, the normal time I wake up for practice back in Princeton. But the Village wasn't a den of craziness. Everyone was incredibly respectful of the fact that most of the athletes there were still competing. Found legend Drew Ginn at McDonalds after the Closing Ceremony! Only the busy 24-hour McDonalds--the late-night/early-morning favorite of athletes from EVERY nation--gave away what we were up to! Kyle, me, and our "British family"! My first few days were spent with my family and boyfriend, who were able to stay for a bit after the racing. Kyle and I had a great time hanging out with the families who'd hosted him out by Eton and then in London. I've been exchanging letters with the little girls who came to dinner with us after my race...they've inspired me to take on some of the sports I've wanted to try and to reach out to more kids who are excited about rowing and the Olympics. 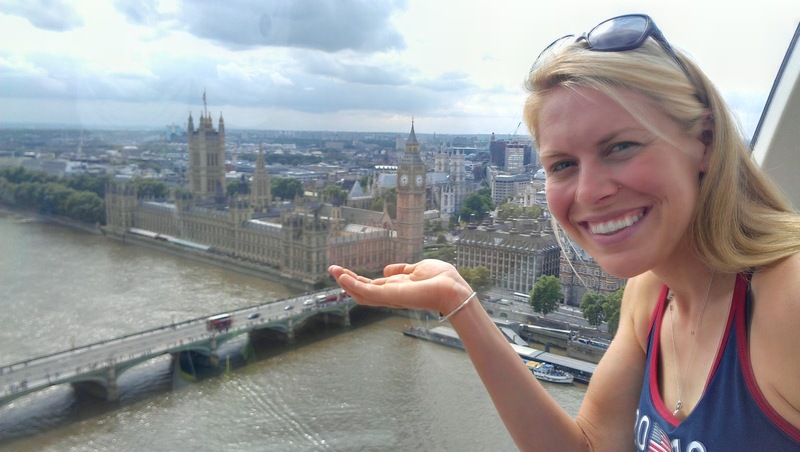 I also got in some sight-seeing around London with my family. Found some proper Bobbies to take a photo with! Messing around up in the London Eye! My bucket list for the Olympics (after winning, of course!) was: watch April Ross (my high school volleyball teammate and hero) in beach volleyball. Watch Usain Bolt run. Swap kit for Swedish Olympic gear. And fill every single minute with awesome! I was lucky enough to check everything off my list. I got to watch April not only in her semi but also in the USA-USA final, where she and partner Jen Kessy played to a hard-fought silver. Beach volleyball gold medal match. Awesome!!! Then, sitting a few seats away from the Olympic flame (MAN! that thing is hot! ), I got to see Usain win the 200m. And on the very last afternoon, right before closing ceremonies, I tracked down the Swedish team's dorm and made a javelin thrower swap shirts. Met Evander Holyfield, fellow Nutri-Grain bar enthusiast, at the USA House! 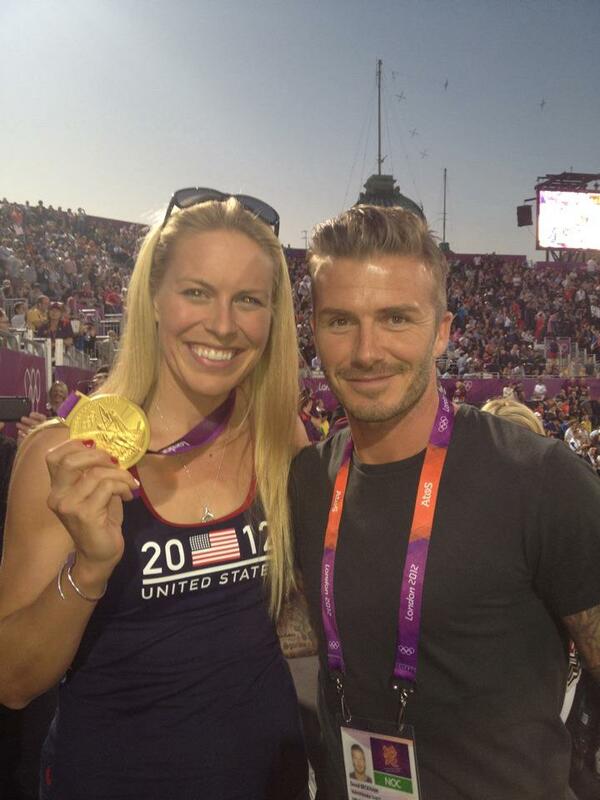 And David Beckham at beach volleyball! Of course, there were tons of other awesome moments, too. We met too many celebrities to list. There were the constant awesome moments of grabbing a tray at the dining hall or signing up for something in the Team USA office, right next to athletes who are your heroes. "Okay, be cool, be cool...holy crap, it's Abby Wambach!" With Abby and the women's soccer team at an NBC event. And then just getting to spend time with my teammates, some of my best friends, without the pressure of practice or competition or another team we needed to make just around the corner. For once, we were free just to spend time with each other and celebrate what we'd accomplished. Just after ringing the bell at the NYSE! We did several interviews and shows, both in London and when we got back to the US. The highlights were getting to ring the opening bell at the New York Stock Exchange--SO COOL!! !--and then doing the Today Show in New York. With Mary and Moose in NYC! After our interview, we got to stick around and cook with Curtis Stone--the dreamy "Take Home Chef" who can make a mean pork belly stir fry. 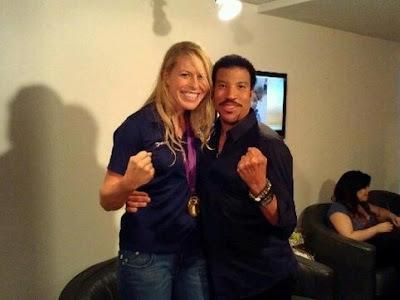 And then, just as we were leaving, one of our media managers came around the corner in a huff--"I just got kicked out of the green room by Lionel Ritchie's entourage!" I put my heels and medal back on, walked back to the green room, and peeked around the corner. Sitting there on the giant sofa, all by himself, was Lionel, who looked up at me, spread his arms and said, beaming, "It's YOU!" Me: "...Yes, it IS me!" (What?!?) The man is amazing, and he told his trainer he wanted to come row with us in San Diego. I can't wait! Besides the media, we've all been criss-crossing the country to see friends and family that we've been away from for months and years. The local pizza place, Massimos--the one you'd always go to after AYSO soccer games--had a welcome home dinner for me, and I got to see so many family friends and friends from high school. It was a really special night. Thanks for an awesome event, Massimos!!! I also got to go speak at my high school rowing program, where there are lots of great kids who are really excited about the Olympics! With the Junior Women at NAC! It's been so wonderful to be able to share this medal with all of the people who helped me be there to win it, and who've backed me up through this whole journey. 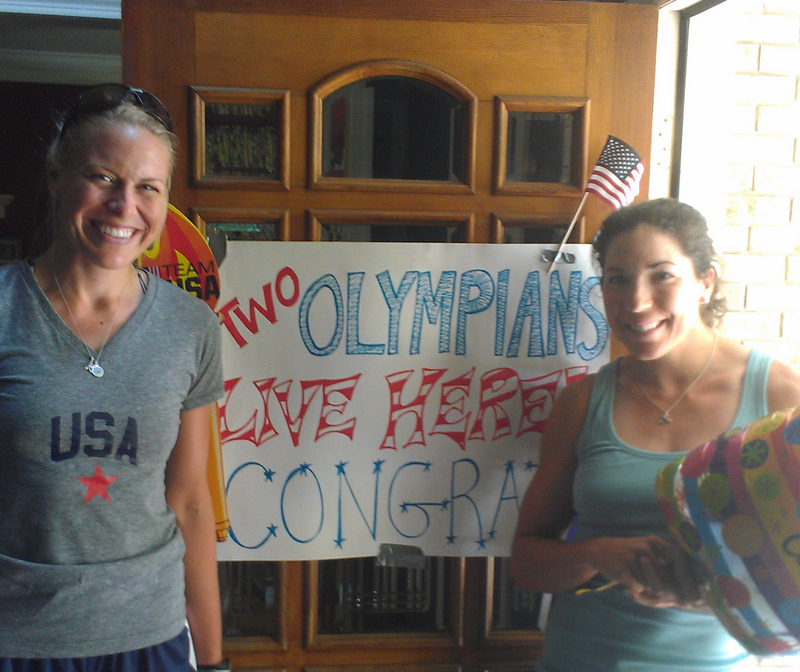 From my first host family in Princeton, to my high school friend's family who've cheered me on since I started rowing. There are hundreds of emails from friends I'm still trying to get caught up on, and my mom handed me fistfuls of cards when I got home. The support this whole journey has been incredible, and I don't feel like this will wind down until I can share this with and thank everyone who's helped me along the way. Thank you for your support and for supporting the dreams of everyone on our team, for believing in all of us long shots. 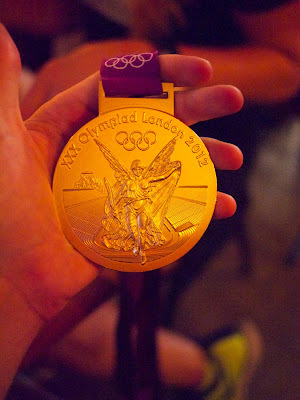 This is our medal. The Race of My Life! What do you say about the race where you won Olympic gold? It was the best race of my career, and we were lucky enough to have that on exactly the right day. I am so thankful I got to share the awesome races we had here with my teammates, and with everyone who came to watch us and who tuned in back home. So many people helped us get across that line, and it was so wonderful to know that we had won for much, much more than just ourselves. 100m to go. Redlining it. Photo: Peter Mallory. I finally had a chance to watch the race for the first time when we got back to the US on the 13th, and everything looks much clearer than it felt. We executed the same strong first 500 that we had in our heat, and when we finally lengthened down to our base rate, we just moved on the field. Just like our heat, it was a little strange to be able to see the entire field, but this time, it didn't feel like a fluke--it felt like we were doing what we came to London to do. There was a strong cross wind that picked up in the middle 1000, but our boat and the rest of the crews handled the sometimes tricky conditions well. As we crossed through 750 to go, the roar of the crowd again got louder and louder. Even with the speakers turned to max, only stern pair could hear Mary for the last 500! But our experience and boat feel helped us execute the last 500 exactly as we'd trained to do. Canada made a last-minute push, but it wasn't enough. We kept rowing and rowing and finally...I saw the bubble line passing up near the stern. (No one heard the beep!) We were across the finish line! And WE'D WON THE OLYMPICS! Immediately, I was overcome with emotion. The night before our race, and the morning of, I had thought back over everything I'd been through, and everything our team had been through, to be there, on that start line. A lot of training, sure, but also a lot of sacrifice, dedication, and above all, the support of the people who'd helped us become athletes who could win Olympic gold. Though I was beaming, the tears came, and I let them. Totally spent, I leaned forward and hugged Taylor, and then flopped back onto Susie. My girls. So, so proud of them and of what we had all accomplished together. The best feeling--this WE won feeling. Photo: Getty Images. The rest of the post-race time is a bit of a blur. First to the media dock, where we were finally able to hug each other and share the moment with each other. Lots of interviews, lots of happy crying, lots of smiles. Then back to the boat to row to the medals dock. Clear eyes, full hearts, strong legs, can't lose. Photo: Getty Images. Wow. This is our Olympic podium. I could see my parents, my boyfriend, my brother, and way, way up in the very last row of the grandstand, yelling her head off, Liz O'Leary, my college coach. Susan punched me: "You HAVE to stop crying. You're ruining everyone's pictures!" We all held hands, waiting for the Dutch and the Canadians to receive their medals. And then: "THE UNITED STATES OF AMERICA!!!" Hey, guys...we did it. Photo: row2k. Such an incredible feeling. Just the nine of us, standing there at the end of a very long journey and a lot of very hard work, getting to share the pure joy of that moment with the world. Olympic Final: Last One, Fast One! First off--thank you for the tremendous support! We had our first race Sunday and the outpouring of good luck and go get 'ems that you sent to me and the women in the 8+ were so wonderful. It was awesome to go to the line knowing how many people we have pulling with us! Taylor Ritzel, me, Susan Francia, and Erin Cafaro off the start! Our race was a good starting point for us--our first race together in this lineup. Some good things and lots to improve on. We lined up against Germany, Great Britain, and Australia at 11:50am, just after some brewing thunderclouds had us wondering if racing would be delayed. We were called into the blocks pretty early, so there was a lot of time to sit there, get acclimated to the noise of the camera overhead, the 20 or so photographers on the dock, the spectators shouting, and the huge buoys that mark the starting line and the boot. The boot is a huge plastic guard that keeps the bow aligned as the boats sit ready; when the starting beep sounds, there's a huge WHOOSH as the boots drop into the water and the boats surge off the line. We had a solid start and were able to get out of the blocks and into our rhythm. The cheering of the fans on the shore built as we went--especially cheering for the home town boat in our heat! We were very internal and focused on executing our race plan. The conditions seem to be craziest in the middle thousand, but everyone in our event handled them well. As we reached the last 500, the grandstands surrounded us, lessening the wind a bit but also enclosing us with the thunder of thousands and thousands of spectators. It was literally deafening and so awesome!!! showing off the hard-work hardware! 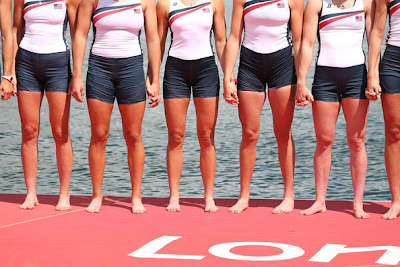 Today, we watched the first round of USA crews line up and race for Olympic gold. 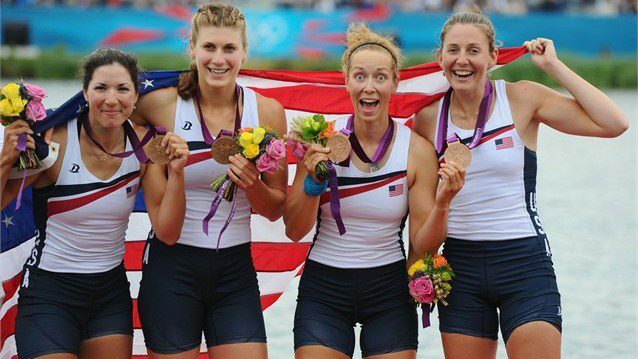 Our women's quad pulled out an awesome bronze finish, the first time the USA has medaled in the event since 1984! I'm so stoked for these women--the rockstars we train with every day--Adrienne "Hammer" Martelli, Megan Kalmoe, Kara Kohler, and my roommate Natalie Dell! Sara Hendershot and Sarah Zelenka, two of the biggest rockstars I know. 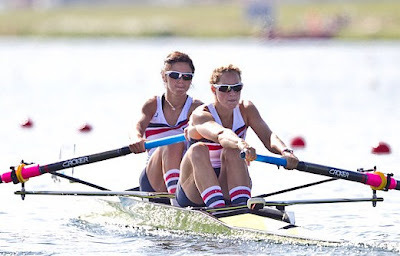 Our women's pair had a heartbreaker of a fourth-place finish, just 0.2 seconds behind last year's World Champions New Zealand. Sarah Zelenka and Sara Hendershot have had an amazing year, building up to an incredible race that was literally stroke for stroke, surge for surge. Tough, gutsy, and so confident--we are so proud to have you representing the USA! Kaspyrzyk, Jake Cornelius, Brett Newlin, and Zach Vlahos gettin' after it. 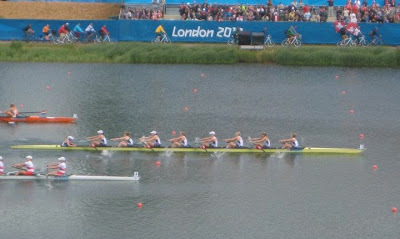 Similarly, our men's eight nearly caught Great Britain at the line, and finished just 0.3 seconds outside the medals. After earning the last spot here just two months ago, our guys performed so well, and did our country proud. Zach Vlahos, Brett Newlin, Jake Cornelius, Steve Kaspyrzyk, Giuseppe Lanzone, Will Miller, Ross James, Grant James, and David Banks, you are All-American all-stars. Tomorrow, at 12:30, we'll line up against five other crews we've raced before: Australia, The Netherlands, Canada, Romania, and Great Britain. It's the Olympic final. 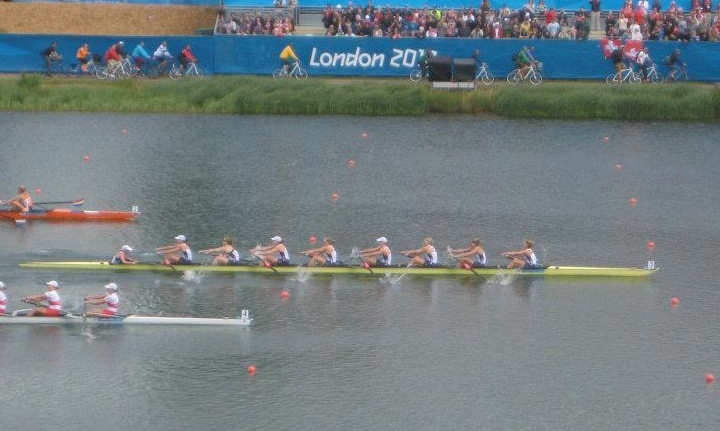 But it's still 2,000m from start to finish, four 500m quarters to make the most of. I'm so excited to build off Team USA's momentum from today and leave everything I can possibly give out there on the water tomorrow. It's been a long journey here, but now that we are about to race, I am thankful for every up and down along the way that has prepared me to give my best here in London. I know how much work (and good luck, too) went into being here, being the most physically, mentally, and technically prepared I've been in my career. I remember watching the Opening Ceremonies four years ago from a TV at my friend's house in Berkeley, excited to see what promised to be the most incredible Olympics yet, but so incredibly devastated at falling short of making it there. 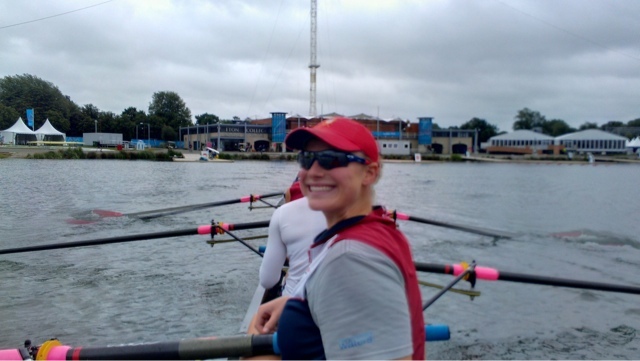 The last four years have been a fight to be the best rower I can be, to push myself past what others and what I thought my limits were, to, if nothing else, make sure that I had used each day as best I could to never feel that feeling again. And I would never have been able to do those things without your support. 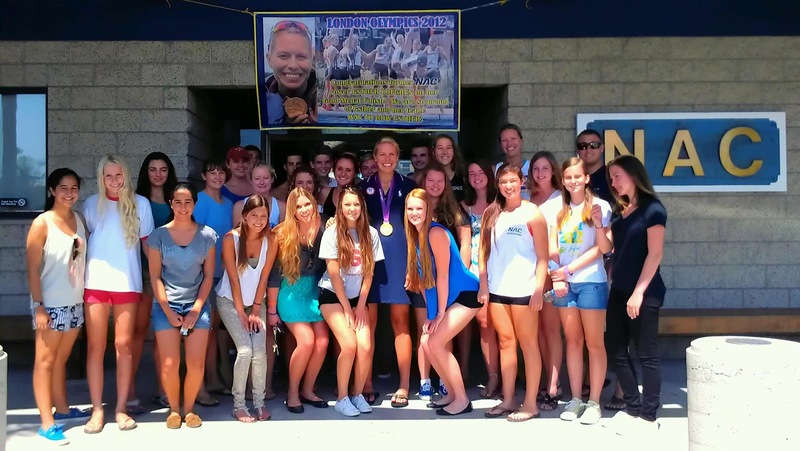 The teammates who pushed me, trained with me, talked rowing with me, and who have become my best friends. The people who encouraged me, who believed in me, who helped me believe that the things I dreamed about weren't impossible. 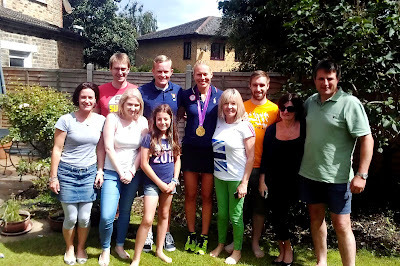 The people who housed me and fed me and who talked me through that tough practice or the ups and downs of selection or erg testing, even if you didn't know exactly what I was talking about. So...thank you. 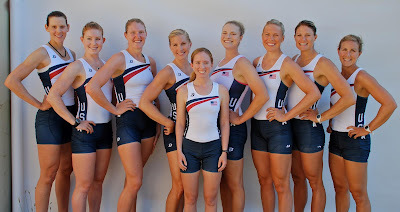 Thank you so much for helping me get to the start line here in London, knowing that I am here in this boat with eight amazing women, that together we are ready to take on whomever we find ourselves lined up against. I am so proud to be representing my country, and I know that when we take that first stroke, we are each going to feel the hundreds of legs of everyone who has helped us get there pushing right with ours. Thank you for giving us this opportunity. I am so excited to see what we can do with it tomorrow. The race course, looking fast and almost ready! Wow...the past five days have really flown by. 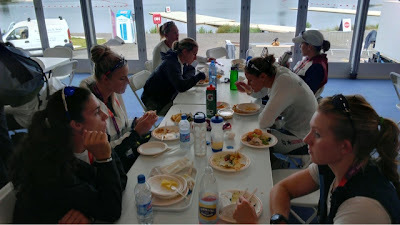 We're pretty settled in now to the Olympic Rowing Village, and the other countries have just started to arrive (for a while, it was just us, Belarus, Zimbabwe, Hong Kong, and a few others!) 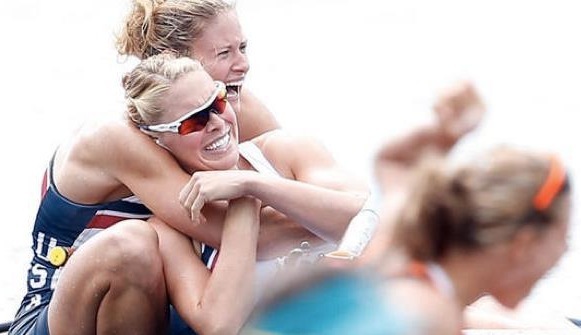 We're also into our normal training routine at Dorney Lake in Eton, which is the same fast course I remember from the World Championships in 2006! 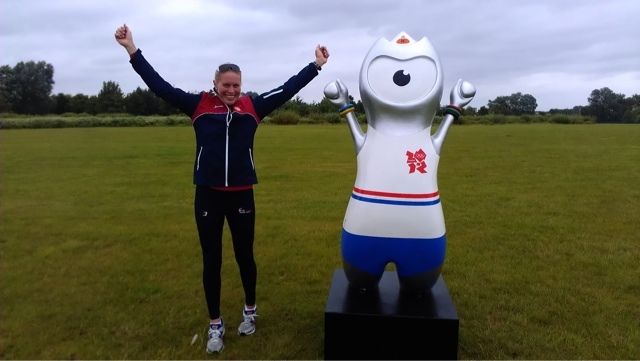 Some things are slightly different, though, like the...interesting Olympic mascots at the 1,000m mark wearing GB unisuits! But once we're on the water, it's just our normal training and racing and getting ready to have the best races of our lives! Taylor, my lovely pair partner, shows off the view from my seat! Between practices, we've been grabbing meals at the course, which has great food and beautiful views of the finish line of the racing! Yummy refueling at the course between sessions. 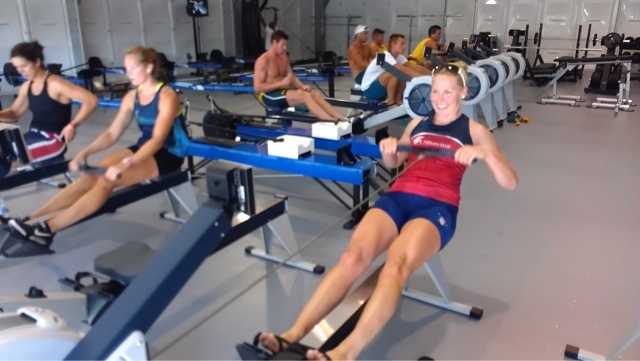 The Village also has a great training room for both us and the Olympic kayakers and canoeists, who will be racing the week after us. The pair and I got in some off-the-water training after getting to watch the awesome racing on the last day of the Tour de France! Erging with the Sara(h)s and some of the Aussie men at the Village gym! That's all for now from us getting ready to race. We're dialed in on our race preparations and practicing, which doesn't make for the most exciting blog posts, but which does make for all of us getting to the line knowing how prepared and focused we are on the work we've come here to do. Team USA is almost all here now--the men's four and quad will be here tomorrow--and it is really exciting to be here, all together, getting ready to represent our country for the big one! Can't wait. Go USA! Wow. The past 24 hours have already been amazing, and we've only just arrived in London! I'm about to shut my eyes after an action-packed but thoroughly awesome day that started in New Jersey and is ending here under my beautiful Olympic-sport comforter here at the Rowing Olympic Village. Me and Saida, Team USA's #1 Fan! We hopped on a red-eye at Newark last night, and before I got a great (if short) sleep, I met Saida, a huge fan of the Olympics and, hopefully, a future rower (I'm always recruiting!) Talking with her reminded me how huge our support is here in the USA, and it was neat to share my goals and journey with her just as I am starting this final step for all of our training with my team. As soon as we landed, oodles of friendly and helpful London 2012 volunteers shuttled us to our accreditation, where we got the passes "our lives depend on"! Then it was off to grab our luggage and head to the Rowing Olympic Village, one of the satellite Olympic Villages near to Dorney Lake. We'll be staying here through the end of racing, and it's a beautiful place to be living with Team USA and focusing on our job at hand: getting ready to have the best races of our lives! Yes--there is a lane just for us! Just before heading in to the awesome craziness! Just minutes later, it was time to head into the city and get "processed". Even after hearing stories from the women in Athens and Beijing about this crazy building where awesome sponsors bedeck you with bags and boxes of gear and goodies, I was totally unprepared for how almost overwhelmingly amazing it was! 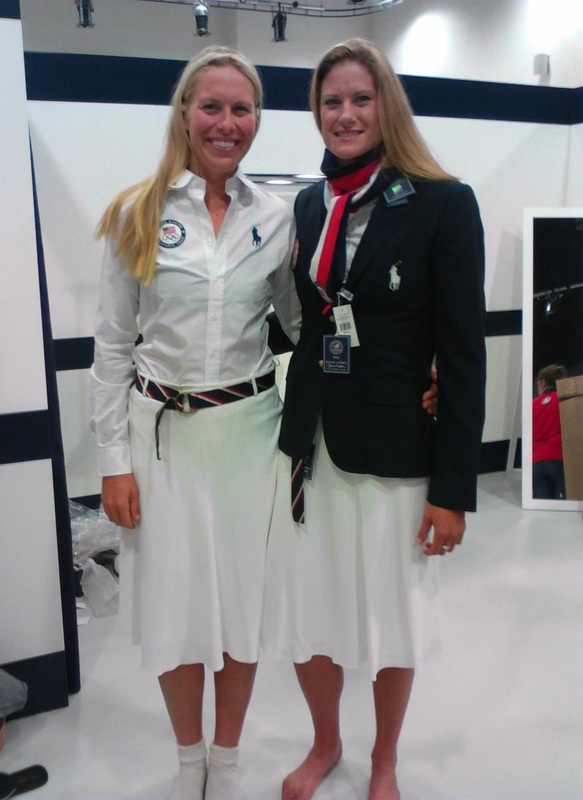 We started at Ralph Lauren, where we were fitted for our Opening and Closing Ceremony kit. The video crew asked me to say a few words about the gear, and it was really neat to have the opportunity to say how elegant and athletic our whole team looked in the outfits! Susan & I modeling closing and opening ceremony kit! A small fraction of the tons of awesome gear we received today! And then--the huge dressing room and what seemed like 8,000 things to try on from Nike and Ralph Lauren, each cooler than the next! Nike designed a whole slew of really sharp outfits, and I couldn't even wait until tomorrow to wear some of it to the dining hall tonight. Our team left looking great and ready to get out on the water and race! A wave from the Queen during our tour-bus ride home. We took a tiny tour of the major London sights on the way home--Westminister Abbey (sadly, no Princess Kate sighting! ), the Gherkin building, the London Eye, the Tate, and many more. It will be great to explore the city more after racing--but first, it's time to race! So then home for dinner, posting this blog, and now, bed. USA team table at the dining hall. One of the other amazing things about today was a letter that was waiting for me when I got back to my room tonight. At our Olympic Ambassador training several months ago, we were asked to write a letter to ourselves, one that we'd open if we made it to the Olympics. I had completely forgotten about it, and opened the letter to find a huge reminder of the work that we've put in as a team over the last four years and the tons of support that are beaming over here from everyone we know in the USA. It was so moving and it really sunk in--this is it. I'm here. At the Olympics. Ready to have the best races of my life and find an entirely new gear to go to in our racing. I cannot wait! This has been unlike anything I've ever done before, and I've only been in the country for just over 12 hours. Just--amazing. I can't wait for what the next three weeks will bring! Go USA! A reminder to be all that I can be. Final stages of packing (for the OLYMPICS!!!) last night! The last two weeks have been a whirlwind of training, media, and packing! We are finally heading out today to London, and I can't wait to get there, train, and finally, finally RACE! We have a bit of a planes-trains-automobiles of getting there, but somehow this feels different than the usual traveling. For now, we're bussing it to the airport, heading to Heathrow, then bussing it to the satellite Rowing Olympic Village, then off to get accredited and processed, and then finally back to the Village to get settled in. Whew! I am so excited to be traveling with my teammates and heading over to represent the USA with everything we've worked and trained and sacrificed for. All of us are so incredibly excited and ready to race, it's hard to think that we'll still have to wait more than a week to actually get to the starting line! And it's also really cool to see the two- and three-time Olympians on our team as excited as us newbies about this whole experience. I'll be updating as we go as best I can, and thank you for sending your support and cheers! Go USA!!! teammate Sara Hendershot on the naming date! We're now just 27 days away from our first race in London! After a few days of media tagging along to practices last week, we're back to normal, training and getting ready to race here in Princeton. USRowing and the National Rowing Foundation have teamed up for the Row to London, a fundraising competition to cover the costs of travel, housing, and equipment for the 52 athletes racing at the Olympics and Paralympics, plus our alternates, coaches, and support staff! You can make a donation through my page here (I'm about 25% of the way to my goal of $2,500! Thanks to everyone who's donated so far!!!) and learn more about the Row to London project here. We've also been reaching out to the incredibly supportive Princeton community. It's been awesome to meet so many great people who are excited about the Olympics and excited to support us! We hosted the inaugural Go for the Gold 5K last weekend and it was awesome to meet so many rowers, runners, and Olympic enthusiasts! 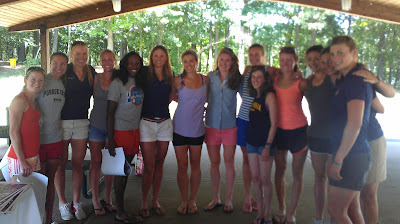 We also got to meet the women's Under 23 8+. That was the first national team boat I raced in, and it was great to meet some of the women I'm sure will be heading to Rio in four years! 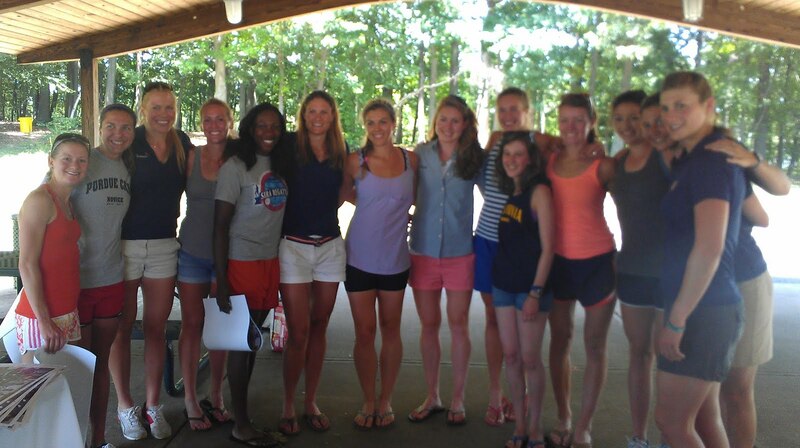 Some of the USA W8+ and W4x meeting the U23 8+ at the 5K! 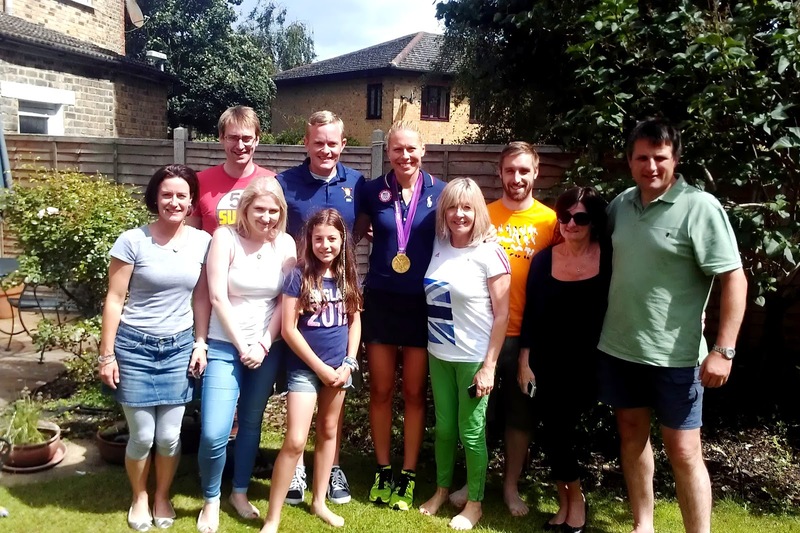 My teammate Susan Francia and her family hosted an awesome Olympic sendoff Bar-B-Q this weekend...the highlight (besides the tour of the Francia home, getting to see some great awkward prom photos, and the homemade Hungarian goulash!) 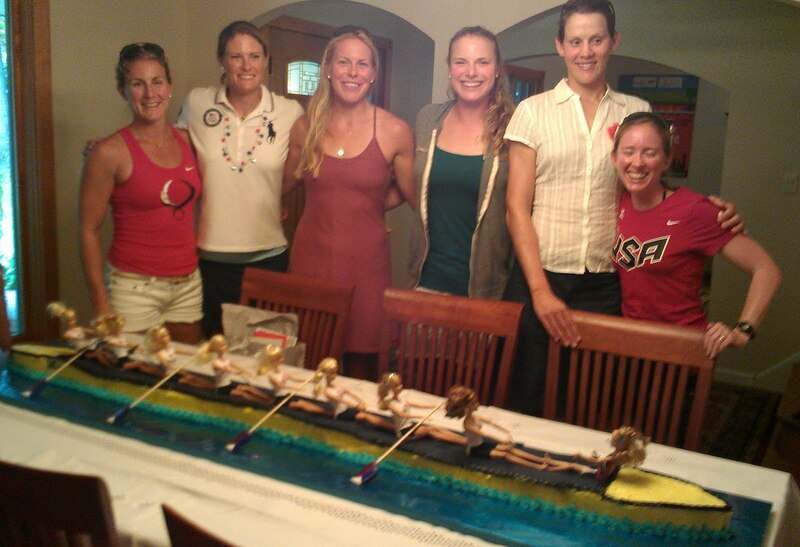 was this amazing cake Susan made of our eight! Yes, it's seven feet long...yes, the Barbies are wearing unisuits...yes, that's an Empacher...and yes, Mary is Skipper! Erin, Susan, me, Taylor, Caryn, and Mary checking out the details! For now, it's back to training and getting ready for the big show in just a few weeks! Thanks for your support and GO USA!!! 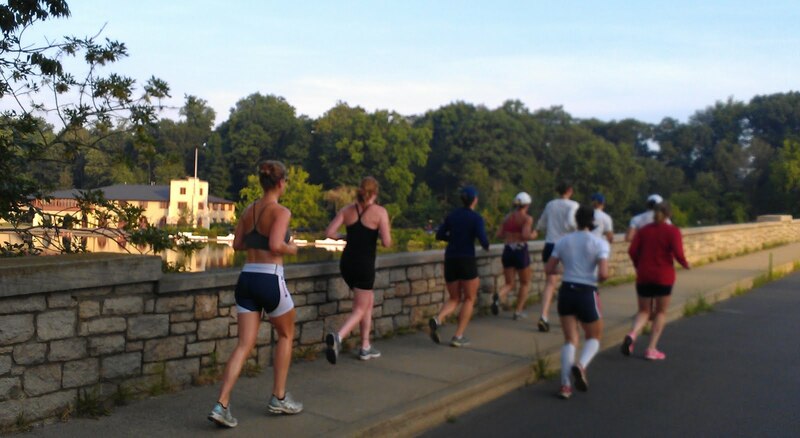 Warmup jog--ready to start another day of training on Lake Carnegie. 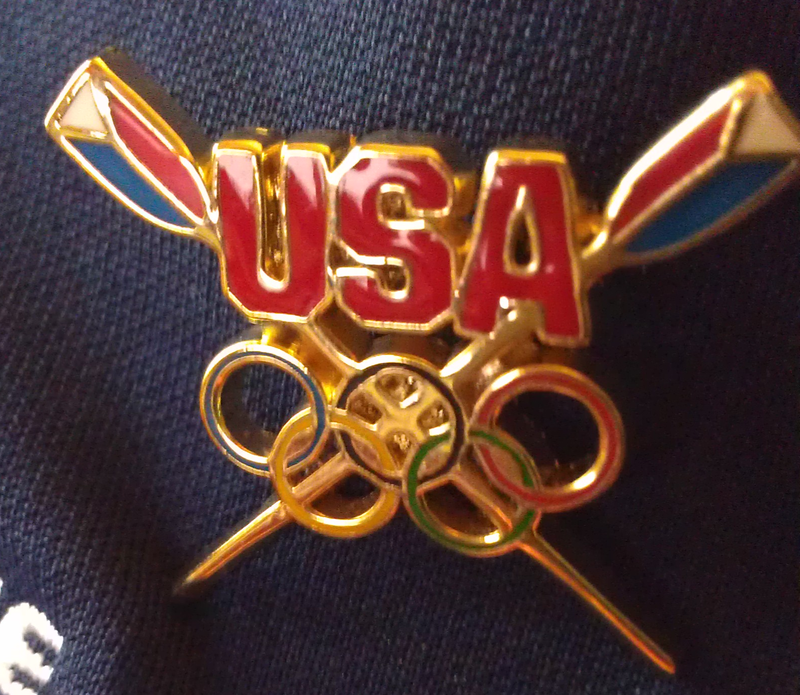 I will be racing in the eight and representing the USA at the 2012 London Olympics!!! Susan Francia, and Erin Cafaro! I wouldn't have been able to do it without the support of my friends and family, and from the people who read this blog. Thank you all for encouraging me to follow my dreams. It has been a long seven years working towards this--being the last one cut from the eight in 2008, again in 2009, working through injuries in 2010 and 2011, and the ups and downs of selection this year. But all those obstacles have made making this team and getting to race this summer even better! It is humbling to be a part of something as big as the Olympic Games, something that so many of my heroes--the ones I idolized as a kid, watching the Olympics on the tiny TV my mom had brought home from work for two weeks, and the ones I still tape into every training journal--have made into the ultimate celebration of humanity and sport. I am honored to be one of the athletes representing the USA, and I can't wait to get out there and race with my teammates and friends! These last few weeks have also been really tough because of what didn't happen. Several women who have done incredibly well this quadrennium--four of them broke world records last month, for example--did not make the London squad, including my best friend on the team. We've trained together with the goal of making this team since 2008, when we were the last ones cut from selection for Beijing, and she has inspired me every day of the last four years. My friend and the rest of these women are amazing athletes and racers whether or not they are racing in London, and our team is as strong as it is because of what all of us have pushed each other to become. So--a lot of emotions, a lot of excitement, and now the hard work begins! We practiced yesterday morning wearing our Olympic unisuits (NBC was there filming–wow!) and racing down the course, it really sunk in for the first time that I am going to be racing and representing our country at the Olympic Games! 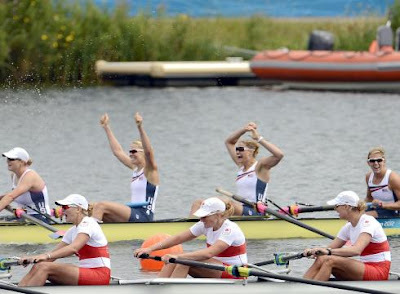 I can't wait to see how much more speed and power we can find as a boat now that we are all together, and I can't even begin to imagine what the whole Olympic experience will be like! 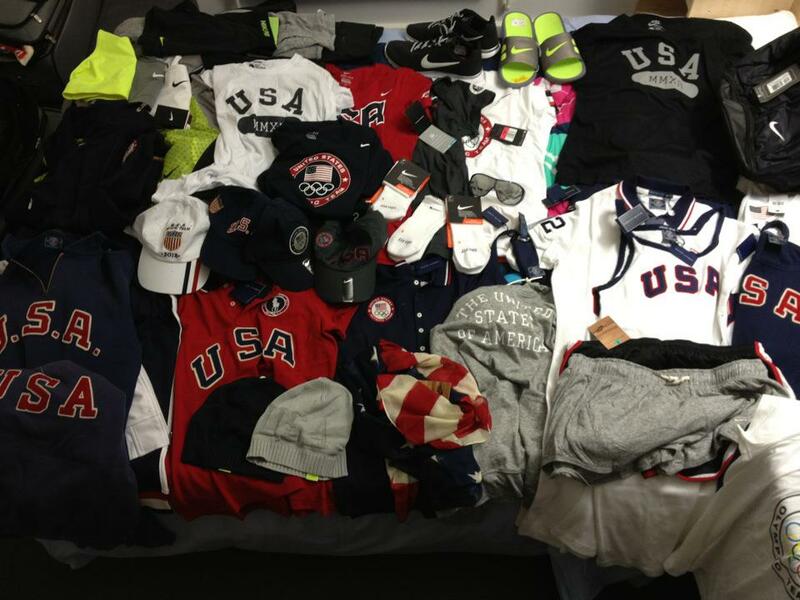 Thank you again for believing in me and supporting me, and for helping me make the Olympic team! Yesterday was our first chance to get out and race outside of the squad, and across the board, Team USA raced aggressively and set a good tone for the regatta. Erin and Elle off the start! Our pair, Elle Logan and Erin Cafaro, laid down some fast 500m splits en route to a solid win in their heat. We are all cheering them on for their semi this afternoon! Stesha, Natalie, Adrienne "Hammer", and Kate racing to a record! Our two quads also did a great job yesterday. USA1, with Kate Bertko, Adrienne Martelli, Natalie Dell, and Stesha Carlé, pushed through the field to break the world record, but finishing a hair behind Germany. The rematch on Sunday promises to be more great racing! Our USA2 quad of Megan Kalmoe, Kara Kohler, Kady Glessner, and just-Wednesday-qualified-for-the-Olympics-in-the-1x Gevvie Stone had a tough draw and raced well. They will be racing for top 2 in the repechage this morning. Me, Susan, Jamie, Amanda, Meghan, Taylor, Caroline, Caryn, and Mary! We had a really solid first race together in the afternoon and were excited to learn afterwards that we'd also broken the world record. More importantly, though, we qualified for the final Sunday, and are excited for the opportunity to race our brains out again! Ken bending it in his heat! Our men's single, Ken Jurkowski, finished a strong second in his heat to advance to the quarterfinal today. And our lightweight women's double raced well in the bumpy conditions and will race the repechage for a spot in Sunday's final. In the meantime, we are enjoying Lucerne as always--the beautiful city, unbeatable breakfasts, and friendly people. Thanks for your support and GO USA!